Threads of Hope, Pieces of JoyLife-Affirming Resources by Loving & Caring, Inc.
By Teale Fackler & Gwen Kik. 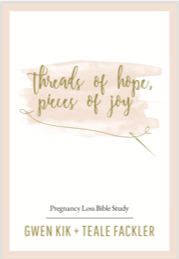 Threads of Hope, Pieces of Joy, has been designed to sensitively minister to the needs of individuals or groups who have experienced a pregnancy loss through miscarriage, stillbirth or any form of early infant death. A few of the questions explored through the study are: "Where do I go to find the truth? "; "Why was my baby too weak to live? "; "How can God help me deal with losing my baby?"